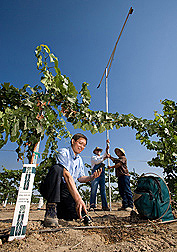 Soil scientist Dong Wang (left) records soil moisture data with a probe as technician Matt Gonzales (right) and agricultural engineer Jim Gartung record grape canopy cover with a spectral camera. Manually collecting data on the ground is necessary for calibrating satellite imagery. As every home gardener will tell you, ground that’s bare at the beginning of summer will soon be covered by the leafy sprawl of exuberantly growing plants. To scientists, the amount of aboveground space that plants occupy is known as “canopy cover.” And though it may evoke images of the leafy canopy of a spreading oak, for instance, the term actually applies to all sizes and species of green plants—from ground-hugging tomatoes to tall, slender cotton. Scientists at the Agricultural Research Service’s Water Management Research Unit in Parlier, California, have confirmed that canopy-cover measurements are invaluable for growers, farm advisors, or irrigation consultants who want to determine precisely how much water a plant has used and currently needs. “A bell pepper with a canopy cover of 40 percent may use, in a week, an inch of water—the amount you might want to replace the next time you irrigate,” says ARS research leader and agricultural engineer Tom Trout. Canopy-cover estimates, used in a standard equation for irrigation scheduling, provide a fast, accurate, dependable, and affordable way for growers to avoid overwatering their crops. Overirrigating can be wasteful and can lead to unwanted leaching of fertilizers and other potential pollutants into underground water supplies, Trout says. Formerly at Parlier, Trout is now with ARS in Fort Collins, Colorado. The concept of using canopy-cover measurements to estimate a plant’s water requirements isn’t new, Trout says. But ARS’s California-based studies are perhaps unparalleled in scope, encompassing an extensive assortment of in-demand orchard, vineyard, and vegetable crops of various age classes, growing in various plant and row spacings, in 30 different California fields. Growers who today would have to walk such fields to make an eyeball estimate of each crop’s canopy cover might tomorrow be able to rely on satellites and computers to do the work for them. Trout and coinvestigators Dong Wang, a research leader at Parlier, and Lee Johnson, a satellite imagery expert with NASA, are using satellites to capture imagery that a computer could analyze and then quickly convert to a crop-canopy measurement. Admittedly, this scenario may be several years in the making. But it has nonetheless captured the interest of the California State Department of Water Resources. The agency has awarded Trout and colleagues a 2-year grant to pursue this high-tech way to save water and satisfy plants’ thirst.—By Marcia Wood, Agricultural Research Service Information Staff. Thomas J. Trout is in the USDA-ARS Water Management Research Unit, 2150 Centre Ave., Bldg. D, Ste. 320, Fort Collins, CO 80526; phone (970) 492-7419, fax (970) 492-7408. "Canopy Cover: The Secret to Gauging Plants’ Thirst" was published in the January 2009 issue of Agricultural Research magazine.